Yoo Hoo Mrs. Goldberg is not just a story of one influential woman, but a wondrous journey of discovery of an era that laid the groundwork for the present. Saratoga Jewish Community Arts, underwritten by a grant from the Jewish Federation of Northeast NY and the Golub Foundation, presents this critically acclaimed film created by Aviva Kempner, whose work includes The Life and Times of Hank Greenberg. 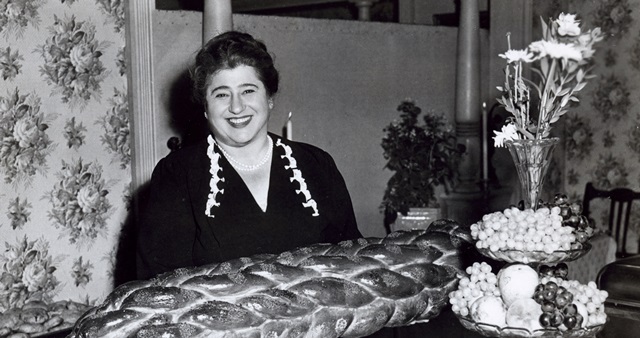 Gertrude Berg, (born Tillie Edelstein in 1899 in East Harlem of immigrant parents) was a force to be reckoned with. In 1929 she produced, wrote and acted on her own radio program as the head of a Jewish American household. The series transitioned to television in 1949, after its long run on radio. The show was a runaway hit on TV as well as it was on radio. In an era of blandness- the 1950’s when Leave it to Beaver was supreme, Berg created a counter image that was both urban and ethnic. Berg considered herself the creator of the sit-com, but the political pressures of the times ultimately forced the cancelation of the show in the mid 1950’s especially following the McCarthy Hearings in the House Committee on un-American activities. Gertrude tried to hold outafter her co-star was investigated,but she lost her sponsors and the support of the network. Her creation, throughout its long run, boldly provided, in an age of Anti-Semitism, a relatively realistic and respectful, if gently comic, version of Jewish New York immigrant life shipped out to be consumed in the American heartland. Molly is always in an apron and always cooking yet women in the documentary Yoo Hoo Mrs. Goldberg remember Molly as a feminist figure because she was strong, an”in charge” person. Her character became the voice to express Gertrude’s definite opinions on any number of political topics such as the New Deal, public education, Fascism, war and voting rights. Yoo Hoo Mrs Goldberg will be shown on Sunday September 24, 7 p.m at Temple Sinai, 509 Broadway, Saratoga Springs with a panel discussion and dessert to follow. A $5 donation is requested. For reservations or information please call 518 584 8730 option 2. Saratogasinai.org; SaratogaJewishCulturalFestival.org and Facebook.